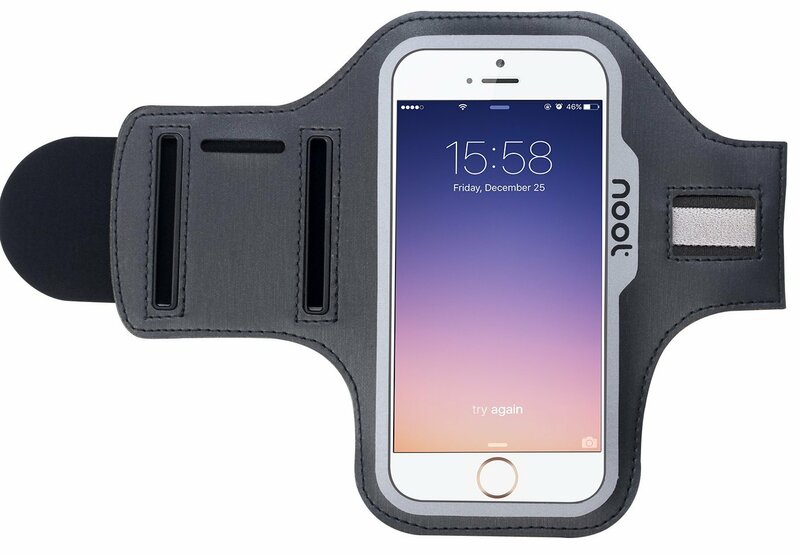 First a confession: I did not get the Noot Exercise Armband Case for working out… I am pathetic when it comes to exercising. Every New Year’s I tell myself it is the year I will start working out. By January 2nd or 3rd I’ve realigned my goals with something more achievable… My reason for getting this band was that I often work at a standing desk but when I’m listening to music the only place for me to put my phone would be on my keyboard, which doesn’t work for obvious reasons. When I put it in my pocket I’m always yanking the headphones off when I catch the headphone cord on my elbow. I decided to give this a try to see if it could solve my problem. It did! The armband comes in a nice compact cardboard package. Although the package was nice it is the source of my one complaint. The package comes with a graphic on the front that shows the armband in use. The only problem is that the armband is listed as a “LG Nexus 5X Armband”, the picture is of an iPhone (the same picture as the Amazon listing)… I’m not a fan of Apple and their phones and honestly this isn’t that big of a deal. My gripe is that as a user I want to see how the armband looks with my device, not a generic picture of it with another device. Seeing the product in real use helps me as the buyer make a decision of whether or not I buy it. The armband is constructed well out of a soft neoprene rubber. It feels smooth and doesn’t chafe when being used. The phone fits almost perfectly in the sleeve and gives you just enough wiggle room to fit your headphones in without being too tight. As I’ve previously admitted, I am not a body builder, I don’t have bulging biceps and my arms are closer in proportion to a twig than a tree trunk. As this is a “workout” band I was worried it might not fit my arms. It came with two different size bands that allowed it to fit not only my arms but my co-workers arm who is a bit more on the hefty side then I am. It comfortably held my Nexus 5X, a Samsung Galaxy S5, a Samsung Galaxy S4, and Samsung Galaxy S3. Anything bigger would probably be a bit too tight of a fit but anything in the range between the S3 and the 5X would fit comfortably. I definitely recommend this to anyone who is in need of an “exercise/workout” band or even for those people like me who are a little less exercise inclined.